The concept of the world's biggest kitchen table was hatched in January when we discussed chickens; now we go on to preserving/canning in a water bath. The idea is that I write my post here, and if you have a blog, you write a post about preserving/canning the way you do it. When you write your post, leave a comment, with a link to your post and we'll all move around, reading all the kitchen table posts. If you want to use the biggest kitchen table badge (above) please do so. When you visit someone's blog who is part of the kitchen table discussion, please be kind enough to leave a comment. If you're a learner, and want to ask a question, do so in the comments section, and anyone with experience can answer. Hopefully, each question will have a few answers. I don't have time to transfer the links like I did last time. Please leave your link in comments, and we'll all find you from there. The weather is to blame. Cold, snowy winters in the northern hemisphere and mild winters in Australia, have given us differing ways of processing our food. My understanding is that in North America, meat, fish, vegetables and fruit are all processed in pressure canners and stored for those long cold months when nothing can be grown on the farm or in the backyard and it's too cold and snowy for hunting. Of course, people back in long gone days relied on having those stores to tide them over, now many of us are able to go to the store to buy pineapples from Thailand, salmon from Alaska and peaches from Greece. Modern commerce has bypassed the seasons and the need for having the skills to 'put up' enough food to keep a family going for many months is fading fast. In Australia, where the climate is not so harsh in winter, preserving food to see families through the winter hasn't been seen as such a priority. There is a long, fine tradition of homesteaders 'putting up' food, because they were so far away from the shops, and they would do that when the season was high and crops were plentiful. But in the cities, apart from bottling a favourite tomato sauce, jam or chutney, or backyard peaches, plums and cherries, which were all done in a water bath, preserving took a back seat. So let's acknowledge that southern and northern hemispheres do things differently, and work from there. Also, this post is about preserving/canning in a water bath, not pressure canning. I don't have a pressure canner so I cannot advise you about them. 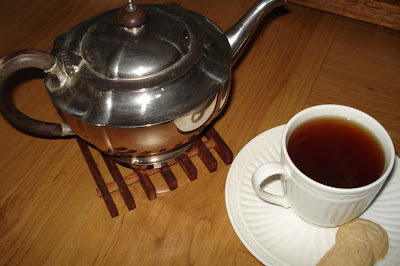 However, these kitchen table posts work because we all write about what we do, so if you're preserving/canning with a water bath or pressure canner, and want to write about that on your blog, please leave your link so we can read it, and learn. I also want to warn you that preserving food in jars has been done for a long time so many different methods have been developed. But there are dangers. 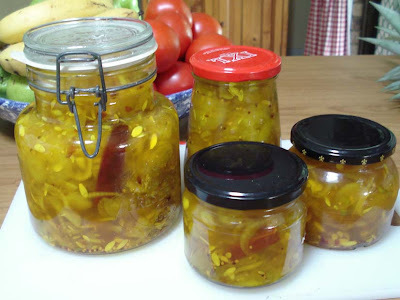 People have died from Botulism poisoning, but it is very rare. Don't use an old preserving/canning book as a guide. Most of the guidelines have been updated in the past 20 years. Please be guided by your thermometer, the information available and your common sense. Water bath processing is suitable for high acid foods like tomatoes, rhubarb and sauerkraut and some foods to which acid, in the form of vinegar or lemon juice, has been added. I have written about preserving in the past, and will give you those links for easy reference later in the post, times and methods are in those posts. I want to use this post to tell you about setting up a water bath from scratch and, hopefully, from what you already have in your home. You can do that by using the largest stockpot you have. You will need a pot that you can boil on the stove, that will allow you to have at least an inch of water over the top of your tallest jar. You'll also need a tea/dish towel folded up to prevent the jars touching the hot bottom of the pan. You could also use newspaper or a round cake cooler. 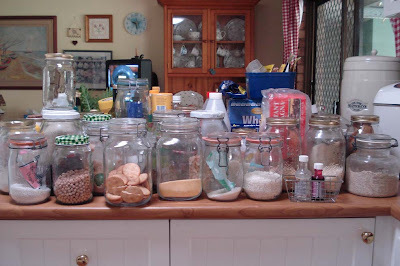 The other requirement for this poor man's preserving setup is a collection of jars. 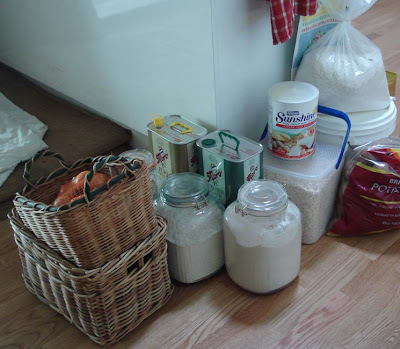 Jars that have been used for food, can be used for this task. Check the lid, it's best to have those little poptop lids, that have a thin ring of rubber on the inside. That will help you seal the jar. 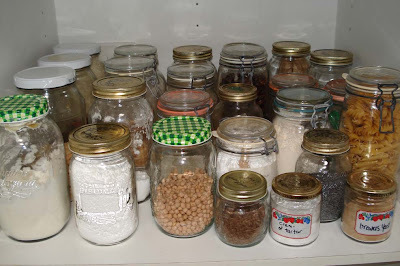 I have a large collection of jars of all shapes and sizes. I use them for preserving and for storing a wide rage of odds and ends. Jars are valuable - don't throw them away. Some people advise against using old jars but I have been using them for many years and have never had a problem. You must make your own decision on what equipment you use and make sure you check your jars and lids and throw away any that are damaged, dented, rusted or chipped. When recycling jars, don't use anything larger than a litre/quart as there is no guarantee that the heat necessary to kill bacteria will penetrate into the middle of a firmly packed large jar. When you've finished processing your jars according to the times suggested, take them from the pot and place them on a towel on the bench. Now you'll have to check that the jars have sealed correctly, because if they haven't, you won't be able to store them in the cupboard, they'll have to be eaten straight away, or stored in the fridge. To check the jars, look at the poptop on the lid. Sometimes they invert while they're in the pot, sometimes they invert when sitting on the bench. Push them with your finger to check. When they're cool, if any have a poptop that hasn't inverted, it hasn't sealed properly; put it in the fridge. You will need a thermometer. I use a milk thermometer that I bought for $15 at a kitchen store. I clip it to the side of the pan and monitor the temperature while the jars are in there. 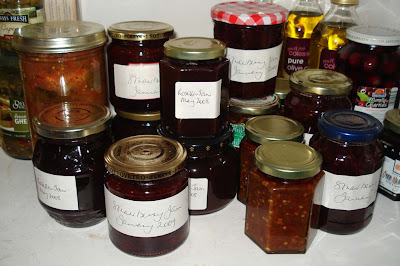 The basic idea behind preserving/canning is that you add your fruit or vegetables to a jar, or make up your favourite jam, sauce or relish as normal, then add it to hot clean jars, seal and place in the stockpot, not touching. Bring the water to the boil, then time the load, keeping it at the necessary consistent temperature. A time guide is in the instructions for water bath processing below. 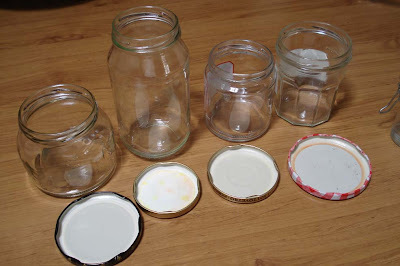 And that's it - you remove the jars when the time is up, let them cool on the bench, check that they have sealed correctly, then store in your cupboard. This sort of food is not suitable as kitchen decoration, light will make the food lose colour and the shelf life is much shorter if it's exposed to light. Use recipes suitable for preserving, there are many books around with a wealth of good preserving recipes. Most of the preserving I do is not to keep us going through the leaner seasons, our garden does that, it's to make a delicious sauce from a glut of tomatoes, to make the most of a cheap or free box of peaches, or to make jams and relishes. All those things I make are family favourites now and all much tastier and cheaper than anything bought at the supermarket. If I make a small amount of jam, chutney, beetroot, bread and butter cucumbers, I pour them into hot jars, and when they're cool, they're stored in the fridge instead of being processed and stored in the cupboard. Larger portions of all those things would be processed in a water bath and stored in the cupboard. At the moment, I have three jars of rosella jam, six jars of strawberry jam, and some relish. At other times I might have double that amount, plus a few jars of peaches. All our beans, corn, carrots and peas are frozen, we dry other things like chillies and herbs, but most of our food is fresh. So as you can see, a lot depends on your climate, whether you have a garden or not, or access to cheap seasonal fruit and vegetables. I think preserving/canning is a great skill to develop. Used in conjunction with other methods of long term storage, it will give you good food out of season, or allow you to make your favourite jam or tomato sauce and have it ready in the cupboard. If you're already well into preserving/canning, please share your knowledge with us. If you're a novice, I hope you decide to learn about processing food this way. Do some reading, if you know someone who is already doing it, ask if they will teach you. There is nothing like hands on learning. 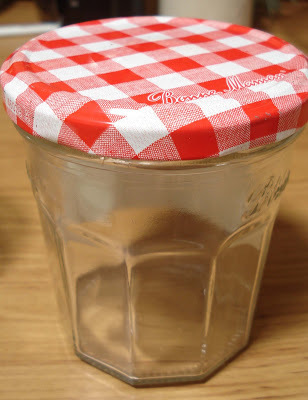 Start small, by putting up a few jars using recycled jars and a big stockpot, and if you like the process, and intend to carry on in larger quantities, look around for a cheap processing unit. Make sure you're aware of the dangers before you start, and we guided by that knowledge and your readings. It's a big topic, but well worth the effort. I hope you enjoy this discussion around the world's biggest kitchen table, now it's over to you. Thank you for coming by, leaving your comment and sharing yourself with me. I so enjoy reading about what you are doing. I live in my world, but I also live in THE world, and I am thankful that we can connect here and learn from each other. Take care. 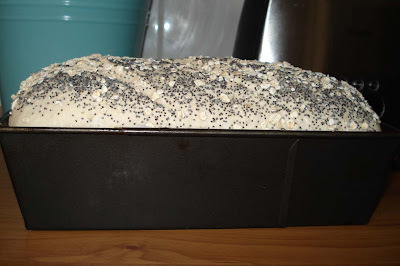 I was asked by Charis to post about a simple bread recipe and I’m happy to do that because I know there are a number of readers who are trying to perfect their bread or just starting out in the wonderful world of home baking. First let me say that it doesn’t matter whether you make bread by hand or in a machine. The aim in making bread is to make a good wholesome loaf that contains no preservatives, is cheaper than a shop-bought loaf, and is so delicious, that it becomes your family’s bread of choice. Either hand or machine will give you that, but you also need to fit bread making into your normal day-to-day activities. We are all aiming for no fuss, not much time in preparation, and good reliable bread every time you bake. If someone tells you you’re not doing the right thing making bread in a machine, don’t listen to them; if someone tells you must use a machine to get good bread, don’t listen to them. Make up your own mind and do it how it works best for you, and that might be a mixture of both, or one of them. Trust yourself. 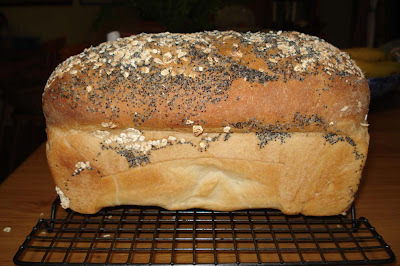 Basic bread is a mixture of flour, water, yeast and salt. There are many other things you can add, but that is your basic loaf. If you would like to add more flavour, you’d add maybe some milk or milk powder, oats, sugar, butter or oil, or different flour – such as wholemeal, whole grain, rye, sourdough rye, soy and linseed, corn and barley or spelt. Each will give its own unique flavour and they have differing nutritional benefits. Remember, white wheat flour, and most other flours, are bland in taste and must have these natural flavourings added. Once you work out what flavour works best for your family, then you can tweak the amounts of salt, sugar etc so you get the bread that suits you perfectly. I have noticed that American recipes call for a lot more salt and sugar than we use here. This is all just a matter of taste - adding more or less salt or sugar to a bread recipe doesn't spoil the bread - so start with a good reliable recipe and experiment with your additives until you get them right. If the recipe you use has too much, or too little, sugar or salt for you, change it. The bread I made yesterday to test out this basic loaf recipe is the most basic loaf I know of. 3½ cups bread flour - can be white, wholemeal, rye, grain - whatever. If you use a heavier flour you'll need to increase the amount of water used. 1 teaspoon salt. Please use good salt, not table salt. Even cooking salt is better than table salt. Put all the above in your bread machine bucket. plus another cup of warm water - I can't tell you the exact amount of water you'll use. That will depend on your flour and the weather. Start with the 1¾ cups and you might have to add more. When it's finished, remove the dough and roll it into a long cigar shape - about 12 inches long. Cut into about 8 pieces for large rolls or 12 pieces for small rolls. Take each piece of dough and work it with your hands into a nice round ball. Place all the balls on a baking tray, add seeds, polenta or a criss-cross and allow to rise for about 30 minutes - depending on the temperature in your house. All the bread machine recipes above can be made by hand as well. More of my posts on bread are here, flower pot bread is here, moving beyond the plain loaf is here, the New York Times no knead bread. My tutorial for making bread by hand. But baking isn’t just about recipes, is it. It’s about technique, knowing your ingredients and doing the right thing. Don't be a passive bystander when you're cooking, become involved in it. Learn about your ingredients and what they do. Know why you're using them. If you store your yeast in the fridge, and you should, mix it in warm water to bring up the temperature before you add it to the flour. You can either wait till it bubbles, so you know the yeast is active, or you can just mix it in and use it after it's warmed up. If you’re using water from the hot kettle, pour the water into the cup first, test it to make sure it’s not too hot, then add the yeast. 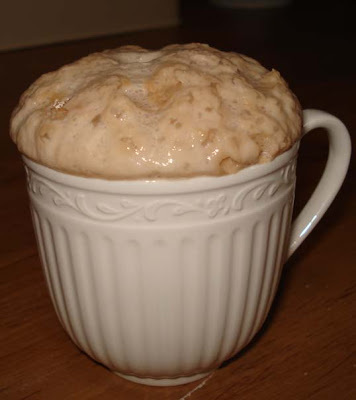 Pouring hot water into yeast will kill it. No matter what type of flour you use, it will absorb differing amounts of water depending on the weather. If it's a humid day you might find you use less water; on a dry day, or in a heated home, you might need more. So when you go through a recipe, be flexible with the water. If a recipe calls for 1 ¼ cups, add one cup and mix, adding the ¼ cup slowly until the dough looks and feels right. If you don't add all the ¼ cup, or if you add a little more, that is okay. Whether you use your hands or a bread machine, you need to touch the dough. Learn the feel of good dough so you know what to look for. Remember all stages of the dough - it changes a lot through the process. Basically, when all the ingredients are mixed together, you want a dough that isn't too sticky (although almost all rye dough will be more sticky that wheat dough) and isn't too dry. Feel it between your fingers and thumb, just like feeling a piece of fabric. Wheat dough will be soft by not sticky. If you're still at the beginning, you can add a little more flour or water, according to what your judgement aims you at. Don't add anything at all at the end of the process, you'll ruin the bread. Don't use too much flour to knead the dough. A light sprinkling is enough. Adding more flour when kneading adds more flour to the dough and at the end of the process that will give you a tough loaf. 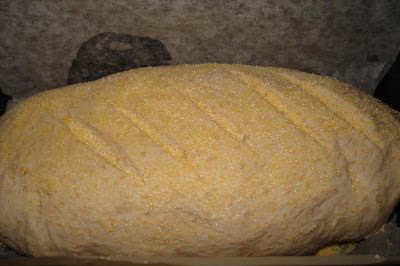 You need a hot oven to bake bread successfully, and the oven needs to be pre-heated for the best results. Bread has two types of rising - one is from the yeast you use, the other is called "oven lift" - you get this when you put properly proved bread dough into a HOT oven. The heat immediately starts to lift the bread. That is what you want. Adding dough to a warm oven won't give you the same result. And the best tip I can give is to warn you that you will have flops, everyone does, but that's okay, learn from it and keep going. 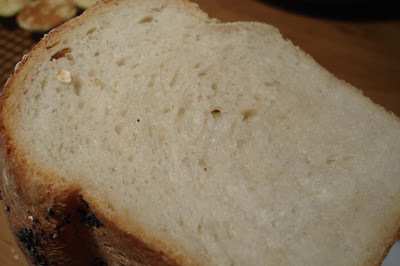 When the bread doesn't rise properly, or if it tastes bland, work out what went wrong and fix it next time. Because if you can get this right, if you learn how dough should feel at all stages of preparation, if you work on shaping your bread and decorating it, if you get into the rhythm of making bread on a regular basis, it will become a joy for you and your family. 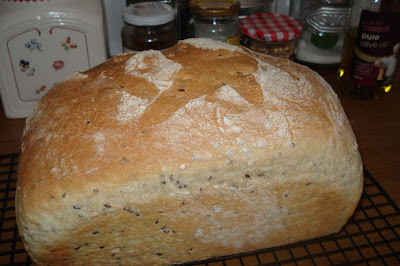 Bread making is one of the true pleasures of living a simple life. Be brave, give it a go. I am still learning about our pecan tree. It sits in the chook run and it is the most beautiful tree in our backyard. It's deciduous, madly green and lush during the summer and a slender skeleton with forking fingers during winter. For many years I didn't know what it was, and I still don't know what variety it is, but I'm happy it's there. Apparently the old varieties of pecan take 12 years to produce their first crop. We have lived here for 11 ½ years and nuts are growing for the first time. 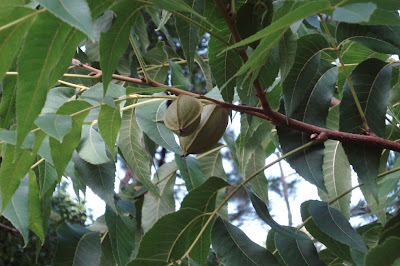 I believe pecans are native to north America so there may be some of you who are growing them. If so, any tips you can give me will be gladly accepted. We don't have the disease pecan scab here and, from what I've read, apart from a ring barking native pest, the pecan grows without trouble here. But I wonder how we harvest the nuts. Do they fall off? We don't have a lot of them but I want to make sure I take full advantage of what is there . A short stroll over from the pecan we're growing passionfruit vines. Both Hanno and I love passionfruit and I think we now have five vines out there in various stages of maturity. Not only are they a delicious fruit, the flowers are beautiful. This photo was taken as the flower was opening so you can see it's white tendrils and deep purple throat. Exquisite! Another uncommon tropical plant that I've been growing here for about 10 years but am only now becoming serious about, are my vanilla orchids. I've grown them in pots until now, have had one or two orchid flowers but never any pods. 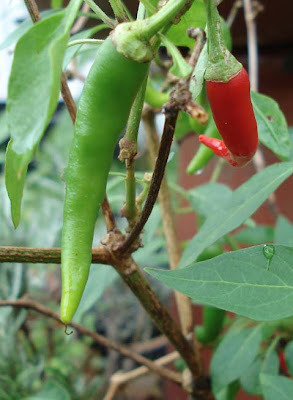 It's a bit of a palaver to grow them for vanilla pods but that is what I intend doing this year. When the luffas are removed from their trellis, I'm planting a few vanilla orchids in the ground near the shade of the banana trees. 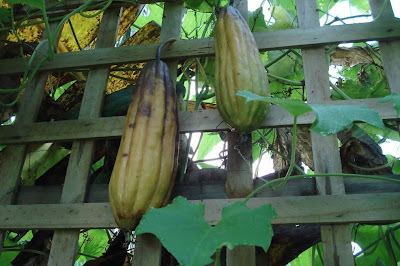 The vines need to grow to a certain height and then have the top of the vine removed from the trellis to grown downwards. That triggers flowering, and eventually, pods. Then comes the hand pollinating, we have no natural pollinators of vanilla here, and then, when the pods are (hopefully) prolific and mature, they're picked and fermented. A long and tedious process to produce that sweet unique flavouring, vanilla. But I'm mad enough to do it. ; - ) I'll take some photos when I plant. I forget who asked now, but someone wanted to know more about the bricks around our raised garden beds. I asked Hanno and this is what he told me. The brick size is 390 x 185 x 110 mm and they're a hollow brick with holes in the centre, which is good for planting small overflowing herbs because they soften the edges. Don't buy the solid type unless they're very cheap. We bought ours as seconds. I think they were a bit under a dollar each. 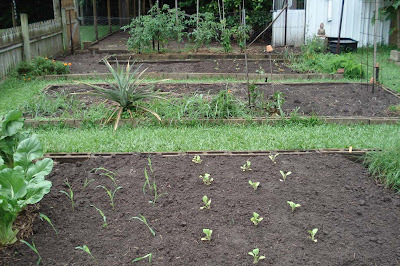 If you buy enough for several garden beds, it will be fairly expensive but it pays off over the long term. Unlike logs, they don't decay or leech into the ground and they're easily rearranged to form different garden shapes. To lay them, set into the flat ground about two inches deep and secure them in with the soil you back fill. I was contacted by Radio National last week. They are doing a program on frugal blogs and will be interviewing someone from slate.com and me for the program. I do that non-live interview today. Shane and Sarndra will be here too, bringing over more of their stuff to be stored here while they're in New Zealand. And when I came home from work yesterday, I noticed Hanno had placed two ripe luffas on the outside table. I'll have to check them out this morning and see if they need more drying time or if they can be skinned right away. I did the first of The Frugal Home workshops yesterday at work and it was a great success. The first two workshops have been booked out. Times are tough now and I hope to pass on some of what I know via these workshops. But now there is bread to be baked, a cake to be made and I'm sure, a hundred other things to do. It's good to be back home after two busy days at work. ADDITION: I'll certainly let you all know when the program will be on. Apparently it will be in a couple of weeks. I believe they have podcasts too, so you might be able to download it if you miss it, or if you're in another country. It looks like a really good swap. I think it's wonderful that so many of you are taking part and I hope you enjoy it. Swapping is a good way of developing new friendships and learning new skills, even if it's straight machine sewing or hand stitching. 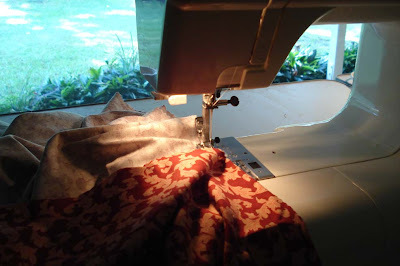 For the experienced sewers, it's a small project to work on that has a surprise element attached to it, and it helps use up those little bits and pieces of fabric that might otherwise be left unused. I would like to take part but I'm really snowed under at the moment so I'll just watch from the sidelines and enjoy the photos when they come in. To Sharon and Rose, I thank you sincerely for the work you are putting into this. I have organised many swaps and I know how time consuming they can be. So thank you both for you work and time. To answer a couple of queries from yesterday: Mike, the tree was already planted when we decided to let the chooks free range around it so we couldn't bury the wire. Instead, Hanno covered the root area, on top of the ground, with chicken wire and held it down with a few bricks and pieces of wood. Initially we covered the wire with straw mulch, but the girls soon scratched it off so we didn't replace it. Since the wire has been there with no straw on top they've ignored the area and only walk under the tree on their way to somewhere else. Margaret: don't plant potatoes in old tyres. Tyres contain cadmium and overtime it will leach out, possibly contaminating the potatoes. If you want to grow potatoes in a small space, use a wire cage. You can make it by surrounding some star pegs with chicken wire. The principle is the same but instead of adding more tyres, you start with an empty cage and as the potatoes grow, add more straw. Sometimes we hill our potatoes, sometimes we don't. We get a good yield either way. Autumn, I use a fair bit of lemon in cooking - cakes, dressings, fish etc. I make some of the lemon juice into cordial, the rest is frozen and used over winter. Maryanne, that's great news! It's always so exciting when the first of your fruit or vegetables start producing. I hope you get a great harvest from those tomato bushes. And to everyone else who left a comment yesterday, I thank you. It's always very interesting for me to read what you write. I like knowing how others are living, doing the same household tasks I carry out here. It's a little bit like a friendly chat over the back fence. One of the things I did last weekend was to clean the pantry. Pantry cleaning is one job that needs to be done every few months so I can check my containers and clean up any spilt food. A few years ago, before we bought our deep freezer, we had a couple of outbreaks of pantry moths that wiped out quite a few kilos of flour. We haven't had pantry moths since we started freezing all the dried grains and flour that come into the house, but I'm still on the look out for them. If you haven't seen pantry moths, and I'm not sure if those we have here are the same world-wide, they are a small brown moth, about the size of a fly. They get into flour, rice, lentils etc, when they're being processed, or in storage, or in the shop, and unknowingly you bring them home. When the product has been sitting on your shelf for a week or two, the moths emerge and fly around the house, where eventually they will find more flour or rice and lay eggs. To prevent this happening, if you can, put all your dried grains and flour in the freezer for a couple of days as soon as you bring it home. That will kill any larvae that might be present. Cleaning the pantry is a simple, but essential, job. The way I do it is to empty everything out of the cupboard, clean the shelves from top to bottom with a terry cloth rag and white vinegar. If anything is spilt - we had a small molasses spill, it is cleaned up with a terry rag and homemade soap and wiped over with a clean moist cloth. If you've spilt any flour or rice in the cupboard, it's a good idea to vacuum the cupboard, making sure you do the edge, where the shelf meets the side wall, to make sure no flour or grain is lurking in the join. Leaving those little bits of food in crevasses attracts moths and weevils and it's best to vacuum them to completely remove any trace. When you have the containers out, check them and wipe them over before placing them back in the pantry. If you notice anything going off or with bugs in it, discard it and wash the container thoroughly. If you do see moths in your container, take it outside to open it. Check that container too and make sure there are no cracks in it and that the lid is still capable of sealing properly. And don't be like me. You can see in the photo above that the potatoes we bought at the market are still in a plastic bag. Tut tut, Rhonda. Potatoes should always be removed from the plastic bag and stored in a basket or similar open, but away from the light, container. Potatoes stored in a plastic bag will sweat and start to rot if left too long. It's not the most glamorous of jobs but when you finish, it's very satisfying. 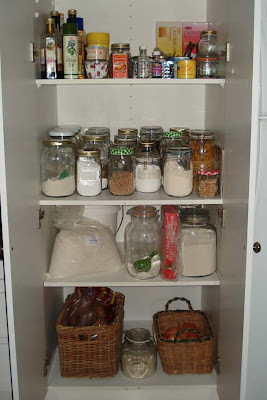 I wonder how many pantry cupboards out there need a good clean. How often do you clean your cupboards? Do you have any tips to share with us? I'd be very interested if you have. I've been too busy to write the second Biggest Kitchen Table post but I think I can do it this Friday. The topic this time is preserving/canning. Hopefully we can dispel a few myths and encourage the younger girls and those who haven't ventured into the world or jars, seals and clips to learn a new skill. UPDATE: We have had one swapper who has had to drop out due to a sudden move from one state to another. I have changed her swap buddy and want to remind everyone to make contact with their swap buddy as soon as possible. If there are any other problems, please let Rose or myself (Sharon) know about it so we can get it all the kinks worked out and everyone can start their projects!! Rose and I are happy to bring you the Dish/Tea Towel and Hot Pad swap list. We must ask each of you to contact your assigned swap buddy without delay. Please add your swap buddy’s email address to your contact list so her emails to you do not end up in your junk or spam folder. If you do not hear from your swap buddy this week, please contact Sharon (cdetroyes at yahoo dot com) if you are in one of the pairs numbered 1 through 29, or contact Rose (rosmar at 1earth dot net) if you are in one of the pairs numbered 30 through 58). We are asking each of you to make at least one dish or tea towel and two hot pads (it is safer to carry hot items with both hands!). The completion date is Saturday, April 25, 2009, at which time you should have mailed your parcel. We are also asking each of you to include a favorite recipe or two. Please do not forget to say whether temperatures are in Fahrenheit or Celsius. Have fun with this swap and contact us with any questions or problems. The hours spent at home during Autumn are the sweetest of the year. It's almost here, I feel the change of seasons upon us, and it calls us to do that seasonal work reserved for this, our busiest time. We plant our main eating crop in March, so as February draws to a close, I plant seeds in trays and Hanno prepares the gardens with compost, worm castings, blood and bone, cow manure and old chicken poo mixed with lawn clippings. It's a healthy brew and it's loosely dug and raked in to enrich the gardens for another year of backyard organic vegetables and fruit. 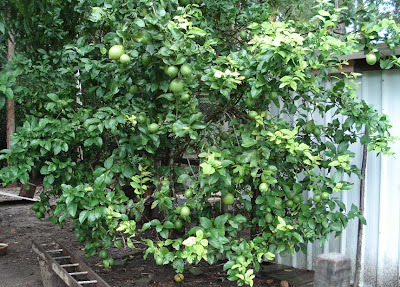 One plant we never fertilise is the lemon tree (above). It's planted in the chook run and with its roots protected from scratching claws with wire, it produces bucket loads of lemons every year. The first of the new seedlings went in yesterday. Above are some corn seedlings - we are hoping for a quick crop before it gets too cold, next to them more bok choy, which we grow for the chooks. They love all the brassicas - the cabbage family - and anything with a sharp, strong taste. Bok choy grows really fast so it's a good one for them. In the photo above you can also see THE pineapple plant. Hanno will transplant that to the front garden soon and we will see if it gives us another pineapple from the new shoot its grown. Here is the potato patch. They still need another month or so before they'll be ready to dig. Beyond that is the bed that was under shade over summer. The shade tunnel was removed yesterday, folded up and put away in the shed. The garden looks untidy now but Hanno likes to start with a clean slate each March, and while some beds still have crops growing, they're all given their feed of compost, worm castings etc, weeded and raked to straight, lump-free perfection. I also bottled up some hot bread and butter cucumbers which finished off the last of the summer cucumbers. These will be stored in the fridge and will probably last until the end of winter. Those red blobs in with the cucumbers are hot chilli peppers, which we grow in the backyard. I have a hand full of them to pick and dry for use over Autumn and Winter because now the cooler weather is upon us, the bush will stop producing. I'll cut the bush back and it will probably give us another crop later in the year. We have some new tomatoes coming in. These are oxhearts and they're filling in a gap until the Brandywines, Moneymakers and Amish Pastes tomatoes are producing. 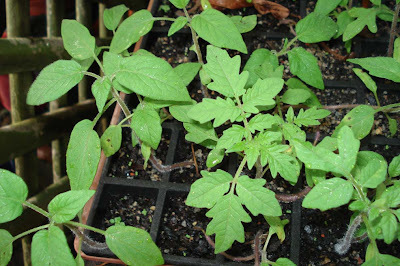 And here are the tomato seedlings growing happily in the bushhouse. On the left are the potato leaf Brandywines, my favourite tomato, next is the medium sized Moneymaker, with its regular tomato leaf. 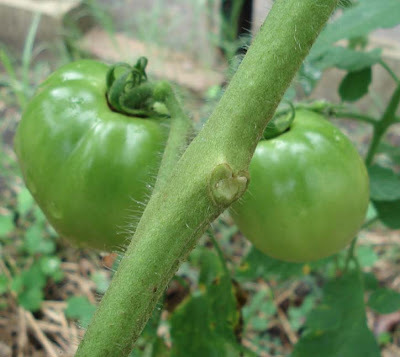 Moneymaker is larger than a cherry tomato but smaller than a regular tomato. and it grows bunches of little tomatoes that hang on the plant like really big grapes. Next to them, and out of the picture, are the Amish Pastes which I use for cooking because of their deep rich flavour. They make a really good sauce because they don't produce as much juice as most other tomatoes. We will also grow cherry tomatoes - we have Tommy Toe here, but they are rarely planted and just come up wherever they feel like it and are left to grow for Alice. My Airedale Terrier, Alice, loves to pick her own tomatoes, and she likes the cherry tomatoes most of all. And what would a post about the garden be without photos of our girls. 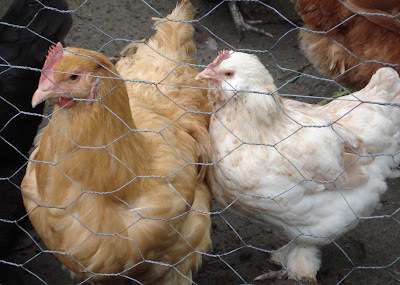 Here are best friends Martha (buff Orpington) and little Heather (salmon Faverolles). They always do things together and although Heather looks like a sweet and fragile little thing, she is like a machine when it comes to turning over leaves and scratching in the undergrowth down by the creek. She has those little feathered legs but no matter how much digging and scratching she does, she always manages to look clean. I wish I knew her secret. You know when the cooler weather is here when we start giving the girls oatmeal porridge. 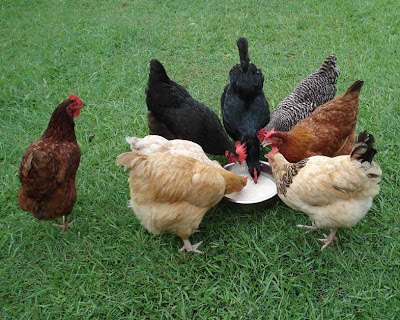 They love eating it and it gives them a protein boost that keeps most of them laying over the colder months. The grass looks really green, much of the back yard is that lovely shade of natural green you get after good rain. This summer we have gone back to the good old fashioned wet season. Like the tropics, here in the sub tropics, we get most of our rain in summer. So over the past couple of months, we've had a good fall of rain a few times a week. It's freshened up all the trees, water tanks are overflowing, the creek is running fast and it feels like the cycle of heat is over for another year. Thank you to everyone who helped Frogdancer's friend Jarryd. This is more than just sending a book. It's helping a young man, via the kindness of strangers and the power of books, rediscover that life is not always so cruel and unpredictable. Welcome to all the new readers who have come this way. Please say hello if you have time. I hope you enjoy reading here. How often do we get the chance to help someone whose life has been completely turned upside down? Not often. We do favours for people, we give to charities, but when is an act of kindness given to someone who loses everything in the space of one single day? I was wondering if you'd like to let your readers know about a book drive I'm organising for my friend's son. They were totally burnt out in the bushfires near Traralgon (literally drove away with nothing but the clothes on their backs and their cat and dog). He's 17, a real literature nut, and we're sending him books to help replace all of the ones that he lost. Plus a few more to broaden his horizons. If any of your readers are book lovers then they'd know how lost he is without his library. My aim is to make his postman curse the day that blogging was ever invented!! If you can help, please do. A random act of kindness will lift your spirits and make your heart feel good, but more than that it will help a young man regain his faith in the goodness of people and give him books to fill his brain and form his future. I am so pleased to see James Joyce and Thomas Pynchon on the list! Read frogdancer's post and book list here. Apparently her email is down so leave a comment at her blog, or here and I'll pass it on to her. If you were wondering if you could help after the fires, this is a quick and simple way to make a real contribution - grab a suitable book, slip it in an envelope, write a note telling Jarryd that you're thinking of him, and pop it in the post. How easy is that! Our luffas (loofahs) are almost ready to pick. They have snaked their way up a very high trellis, grown in the sun and rain of summer, and are now almost ready for harvest. Our season this year has been very disappointing. All the vines grew strong and healthy but there was a lot of rain and lower than normal temperatures, which resulted in very few female flowers. There are only about six good ones there this year. In a good year, we can grow enough luufas to see us through the year, but no matter, there will be another harvest next year. Those we have now will be harvested soon and all will be put to good use. Luffas are gourds, and the only source of vegetable sponge. 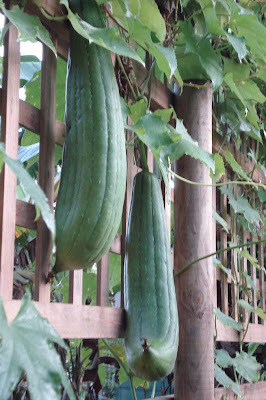 Although they can be eaten like zucchinis or cucumbers when young and tender, allowed to grow to their full maturity, they will give you a very good exfoliating sponge. The seeds and leaves are also edible. They are usually used in the shower but are also very handy in the kitchen when cut into discs and used as pot scrubbers. Luffas grow well in hot climates, according to the hardiness zone below, I live in zone 4, but I think you could grow them in any area where you don't have frosts. Even then, I'd try them in a sheltered area, possibly up against a brick wall that you attach a trellis to. Remember, the lower the temperature, the fewer luffas you'll get. You may be able to get them to eating stage in the cooler climates but they usually fail to develop to sponge stage. It's best to germinate the seeds in trays or pots and transplant the seedlings. Soak the seeds for 24 hours before planting, they will germinate four or five days later if you're in a hot climate, or up to seven days later in a cooler one. Grow the seedlings in a tray or pot until they're a reasonable size, then transplant to the garden. To grow luffas, you'll need well drained, rich soil with a high content of compost and organic matter. When you transplant them, water in with a seaweed solution to help with transplant shock and to help them establish. They need a trellis or fence to grow on as they need to be off the ground. When they're growing well in the garden, give them a drink of weak organic tea- like comfrey tea, or compost tea, once a week, to help them along. About eight weeks after planting, flowers start to form. When you notice the flowers, stop feeding them and give them a dose of sulphate of potash. That will give you the best chance of flowers and fruit. 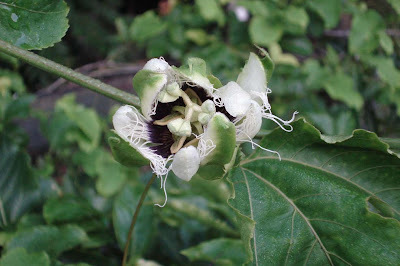 The male flowers will appear first then, slowly, the females appear; they bear the fruit. The hotter your climate, the more female flowers you'll get. Make sure you have bees around to pollinate the luffas, otherwise you'll have to hand pollinate them. If you're in a warm or hot climate, they're easy to grow but they do take three to four months to grow to a decent size. 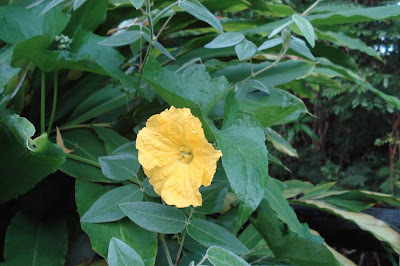 They're a good plant to grow in a sustainable garden because in addition to being edible, they will replace your kitchen sponge and pot scrubber and can be used like a sea sponge in the shower. I'll do another post on my luffas when I harvest and skin them. I'll show you then how to process them after picking and how to harvest the seeds. I must have done something good in the past to deserve the wonderful group of readers I have here. I was overwhelmed by the response to yesterday's post and the jump in visitor numbers. Thank you. Those of you who read here regularly know that Mondays and Tuesdays are the days I do my voluntary work and on those days I'm always busy, rarely able to comment during the day. Usually, all I can manage is to read the comments and okay them for publication. I sometimes have good intentions and resolve to answer when I come home, but when I get here and there are emails waiting and a husband to talk to, I walk away from the computer so I can relax and recover from what are always mentally and physically challenging days. But now I've had a good night's sleep and I'm ready to face the world again. Today's post will be a bit of a patchwork affair. 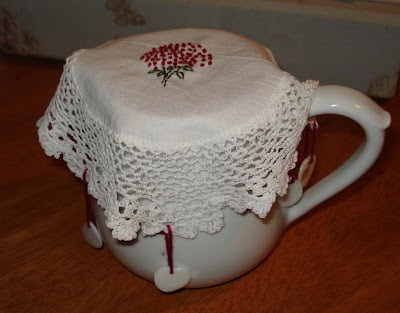 I want to show you a very quick milk jug cover made last week and I hope to answer the questions asked in the comments this week. Before I go on though, Sharon will be posting on Friday, after the deadline closes on the swap on Thursday. She will then give you all the details you need about the swap and let you know when the list of partners will be ready. I made this little cover to show you how to make a jug cover using something you might already have at home. 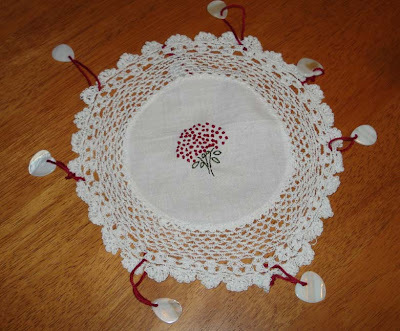 I used a small old doily, stitched this little posy of roses on it and tied on some weights in the form of pearlised dangling buttons. You could also use shells from the beach that you drill a hole in, or just your average buttons. I think buttons of different sizes would be fine. 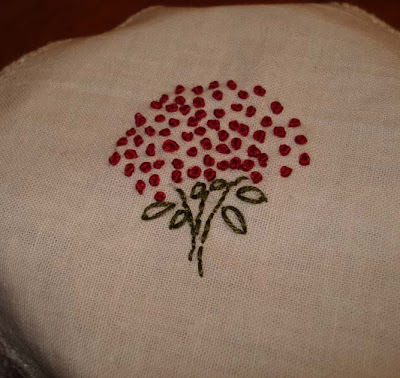 The stitches used here are backstitch and French knots; the entire thing was finished in an hour. It's just right for a weekend craft or a weekday one for those of you who are working outside the home or have littlies and need a small project that you can pick and and put down. Now, to answer some queries. Sarena, I grew the pineapple by cutting the top off a bought pineapple. I let the top dry out a little and then just planted it in the vegetable garden. Hanno fed and watered it, and, I have to tell you, complained about it for two years. He didn't like it in the middle of the vegie patch where he wanted to plant other things. But for those two years, he cared for it. In Spring of the first year it sent up a spike that turned into a fat pineapple. It took a long time to ripen and when I picked it, after it had fallen over due to its weight, it sat on the kitchen bench for about a month. It slowly turned that lovely golden yellow that screams ripeness, but I kept testing it by trying to pull a leaf from the top. That is the true test of a ripe pineapple. When I could pull a leaf out, I cut it open. And yes, it was worth the wait. CM, I'll ask Hanno to help me with a raised bed post. Just last week he took photos when he cleaned out one of the water tanks and he'll help with that post soon too. Carmell, don't aim for perfection, love. Nothing needs to be perfect, just good enough for you to enjoy your home. And get the kids to help you, it is their home too and they should at least keep their rooms clean and tidy, depending on their ages, of course. When my boys were very young (4 and 5), I taught them to get their own breakfast - just cereal and milk, not toast or anything cooked. They enjoyed that independence and it lead to other things. I think children benefit from having to help in the home. It teaches them how to look after themselves and it allows them to contribute to the home, and that gives them self respect. I hope you find some enjoyment in your homemaking. I send you warm hugs. It's good to see you back, Gail. I was wondering where you were. Attilathehen, I too like seeing others living as we are. It's comforting to know there are many others out there who are doing it or working towards it. jenniepowell, I'm sorry to hear of your illness and hope today is a bright one for you. I don't claim to understand depression but I have a couple of people very close to me who suffer from it and I see others at my work. I send my best wishes to you and hope you find true and lasting happiness in your home life. Don't ever expect, or aim for, perfection. All you need is to do what needs doing on that particular day and if you can't manage that, there is always tomorrow. Look after yourself, love. Joanne, thank you for your thoughts and for reaching out. Yours are wise words and I appreciate you sharing them here. Hello Colleen, yes, I get the picture. I had days and weeks like that when my sons were little. As I said before, don't aim to be perfect, just do what you can do and be satisfied with that. Everyday strive to do a little more, if you can't, then you can't, but try again the next day. Big hugs to you. I hope you like your hot chocolate today. Alecat, thank you for the award. I appreciate you thinking of me. However, I have to tell you that I stopped accepting awards a few months ago because I never have the time to pass them on. Thank you anyway. I left a comment on your blog. And to all of you who needed the encouragement of this post, to those who stopped and reflected on how they do their work, and to those who are struggling with illness, I send my best wishes to you and hope today is a good one. Rachel, I've never tried soap nuts but I've heard of them. I'd be interested in knowing how you go with them. Good luck growing them too. Hi Donetta, it's good to hear the sourdough is a great success. I'll start another one as soon as I can. Blossom, leave the borax out if you use your grey water. It can build up in the soil. Make sure you use the washing soda with the soap, you might even like to increase the amount. I'm sure it will be fine. Ajoyfilledlife, you can use water from the washing machine on your garden but don't add borax to your washing powder or liquid. However, you can't store grey water because the bacteria, which quickly die in the garden, will multiply in a rain barrel. 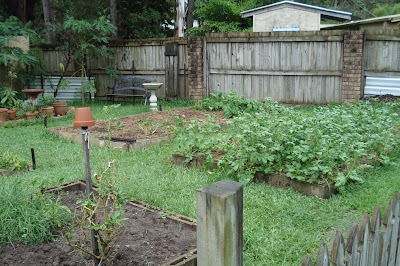 Many people in Australia, run a hose from the laundry straight onto the garden, and move the hose to different areas in the garden when they do the laundry. So if you drain the grey water into a barrel, make sure you use it that day or the next. And good luck with your gardens. Jan Hatchett, adding caustic soda to your laundry mix is not a good idea. It will clean, but it will also harm your clothes, sheets and towels. It's too strong. The caustic soda in soap is neutralised in the process of soap making, and that removes the ability of caustic soda to burn - both clothes and skin. You may not notice it straight away but the fibres in your fabrics will be weakened by it. Use washing soda, not caustic soda. Vinegar is not necessary as a rinse aide. I rarely use vinegar in my washing machine and my clothes are fine. If you do use vinegar, usually the smell goes when the clothes/sheets/towels dry. If you're concerned about soap buildup in your washing machine - and usually the addition of washing soda and borax stop that build up - run an empty short cycle with a cup full of vinegar. That will clean everything out. Hi Angela, Hanno used to be a diesel mechanic so I know about greasy work clothes. There is a heavy duty laundry powder recipe in the green cleaners link that should work for you. Make up two batches of powder - one for your normal washes, and one for your husband's work clothes. The ingredient in the heavy duty mix that makes the difference is it uses as stain removing soap and if you can let the load soak for an hour or two, all the better. Our stain removing soap here is called Napisan but I'm sure there is a similar overseas if that's where you are. Another way to deal with this is to make up the normal washing powder and add a cup of powdered oxygen bleach. That is also called Napisan here but I use the Aldi verson of it because it's much cheaper. For use on worker’s greasy or dirty overalls, football and sports uniforms or fabric that has food spills. Mix all the ingredients thoroughly and store in a plastic container with a lid. Use two tablespoons per wash. The powder will not make suds. For a very heavily stained load of washing or tradesperson’s clothes, if you have a top loader turn the machine off when the powder is completely dissolved. In a front loader, operate the machine to dissolve the powder and then stop the machine for an hour to soak the clothes. Leave to soak for an hour, or overnight, and then turn the machine on and continue washing as normal. If there are any readers who have a good and reliable source where you buy washing soda and borax, would you please share that information with us. There are quite a few readers, particularly in the US and UK who have trouble finding those products. Leann, the ingredients for soap making do need to be accurately weighed. I use an old postal scale and it does a very good job but any scale that is accurate would do. Linda, washing soda is sodium carbonate. Does anyone know where Linda can buy washing soda in South Africa? Hi Kim, it's good to see you tried the soap and it's working well for you. Elaine, the homemade soap is more expensive than commercial "supermarket" soap, but less expensive than the natural soaps you buy online or in little stores. I was interested to read your comment, Billie. 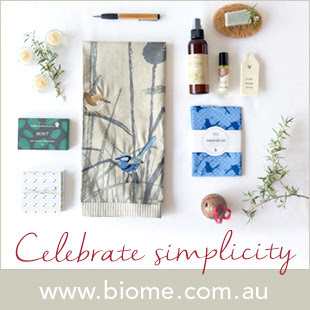 I sometimes use emu oil or olive oil as moisturiser on my skin, both work well. I'll be experimenting with some lotions soon so I hope you keep in touch and let me know how yours work out. Hi Ellen, yes, I really like rice bran oil. Adding it to soap makes a noticable silky difference. Maureen, I'm sorry I can't help you with an air freshener, I never use them. I wonder if any of our readers here have something to share with us. Hopefully there is someone who can help. Barbie, it's good to see the family on board with this! Kim, how great your dad is helping. I think the soap will be good for your baby's skin. I have two washcloths and some homemade soap ready to give my next door neighbour who is due any day now. Lady Katherine, it's fine to share the recipe, the more people using it, the better. Hopefully we'll have some readers today who will tell us where they buy their supplies for soap making. 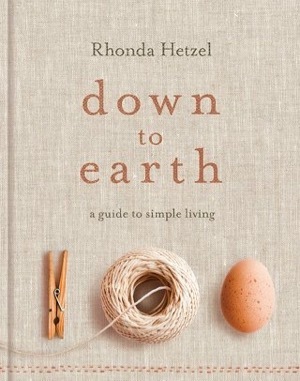 I love the Back to Basics book too and have written about it somewhere way back. It's a great book with a lot of very helpful information. Robyn, I've written above about leaving the borax out, it's fine. Cornstarch and water makes a good starch but you could also use wheat flour and water. I used to love making the starch for my mother when she did the washing. In those days, almost everything was starched. LOL! Que, you can't use the aluminium forms unless they are lined (with plastic) - it will ruin the soap and the forms. The soap makes about 10 or 12 cakes, depending on how large you make your cuts. This post is very long, I'd best stop. Thanks for the comments. It is really interesting reading about the lives being lived in Australia and far off places. I used to be one of those people who looked down on housework as something to be avoided at its best, and demeaning at its worst. 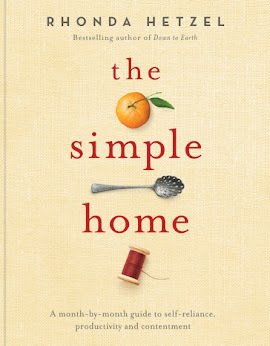 But when I came to live a simpler and gentler life, I discovered along the way that doing the work needed in my home, slowed me down and made me think about my daily work in a different way. The work remade me. Instead of whizzing through the housework as fast as I could, I slowed myself to do each job well. That slowness allowed me to think about the task as it was being done and how that task connected to the others that followed. I realised then that all those connected tasks made our home what it is - and that it could either be the comfortable and nourishing place I wanted to live in, or a chaotic jumble of disconnected and generally unfinished chores that didn't encourage anyone to relax and put their feet up. I wonder now if having that chaotic home caused me to go out shopping for things to fill our home - I think I might have been looking for comfort in the shops instead of hand making it at home. That's what we've been encouraged to believe - that if we need something we will find it in a shop somewhere. We are taught at a young age that we buy happiness. I'm wiser now, I know now that my happiness is made with what I already have at home. 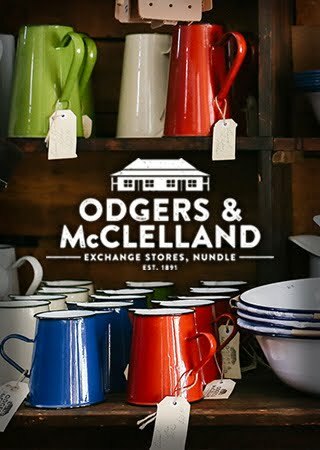 There are no special requirements needed; rearranging, keeping everything clean, changing with the seasons and making odds and ends, gives me more satisfaction than shopping ever did. So how is happiness and joy found in the normal course of the everyday? Shhhh, it's a secret, but I'll let you in on it. It's found by slowing down, focusing on what you're doing, taking pride in a job well done, and repeating that on a daily basis. When you get into the rhythm of your home and work towards making every square inch of it comfortable, the work itself gives the reward because you make your home exactly what you want it to be. Housework isn't difficult, and remove all thoughts from your head about it being completed every day. Every woman knows that housework never ends, so take your time. Slow down and do it well, stop thinking about getting on to the next task, just do what you're doing, then take a short break. Don't make it tougher than it is. Look at your work when you've finished and think about how that space works for you, could it be changed? Could you rearrange things to make it better? Is it just right? Good! Then tell yourself you've done a good job and feel happy that you did that. It is okay to be proud of your work, despite what anyone tells you. Working slowly through your work will slow you down too. If you stop rushing, so will your brain and heart. Slow down and enjoy what you do, well, most of it, I doubt too many people enjoy cleaning the toilet or washing nappies. But even those things are part of us, so carry our those chores as best you can and enjoy the ones you like. I don't have children to look after now, but I used to and I know that my routine now would have suited that time of my life very well. Now I do my every day chores slowly throughout the day - I make the bed, sweep the floor, bake bread, tidy up and cook, and alongside those everyday chores are others that are peppered through the hours. They make the day interesting because they are different every day. All of the photos here today were taken in my home during the course of one day. 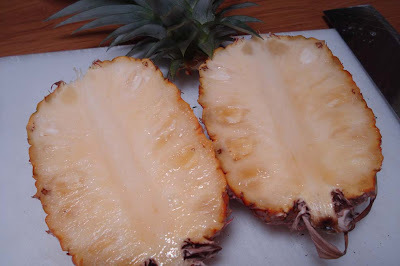 On this particular day, I cut open THE pineapple - the one that has been growing for two years in the back yard, and we tasted the finest, juiciest, sweetest pineapple ever. 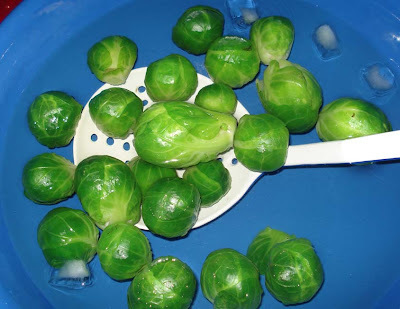 Brussel sprouts, two packs bought at Aldi at a very good price, were blanched divided up into four meals and added to the freezer. A handsome worker in the backyard removed an unstable frangipani and allowed co-workers to scratch in the bare soil, hoping for some fat grubs to eat. Tea was taken on the front verandah. The sewing room was tidied and a tablecloth made with fabric from the stash. It's nothing special, is it? But it makes me feel good and it satisfies me. Making your home a place that sustains you and your family is one of the most important jobs you can do. Times are tough, there are all sorts of things going on in the world that are difficult to understand, but if you make your home a place that comforts, a place where you can relax and be your true self, a place where your children feel safe and warm, a place where you show your family the joy of living simply, then you are doing a really significant and essential job that takes the hard edge off the outside world. So when you shake open the sheets to make up that clean bed, when you set the table with knives and forks, water glasses and a flower in a cup, when your beef stew and dumplings is slowly bubbling away welcoming your family as they come home with the smell of home cooking, when you sit with your tea, when you sweep the floor, when you sew or knit or cook, I hope you find happiness in your home, because I know it's there. You might not have discovered the mother lode yet, you might just be picking up fragments every so often, but keep at it and you will be rewarded. Having the time and the inclination to make many of the things we use here is one of the most satisfying things about living this way. 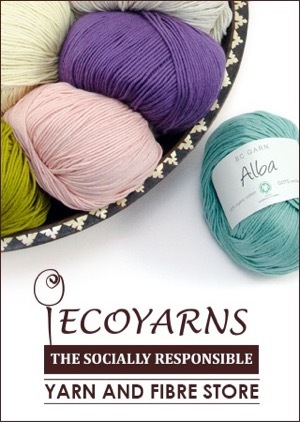 I love making soap, cooking from scratch, making cordials and fermented drinks, I love to sew and knit, and those activities result in products that are usually superior in quality to those bought in today's shops. It also give me the peace of mind of knowing that only the ingredients I put in with my own hands are in there; there are no nasties lurking. I add safety and certainty in with my other ingredients so I know that what I'm making is healthy, and not a product that might look good but is laden with chemicals I can't pronounce. And so for all those reasons, I love making my own soap and laundry powder. I'm currently luxuriating in a lovely olive oil-rice bran oil-coconut oil soap that is creamy and lathers well. It's my favourite soap and if I never tried another home made soap, recipe I'd be happy with this one. I'm washing my hair with it too and it does a wonderful job, as good as the best organic shampoo. 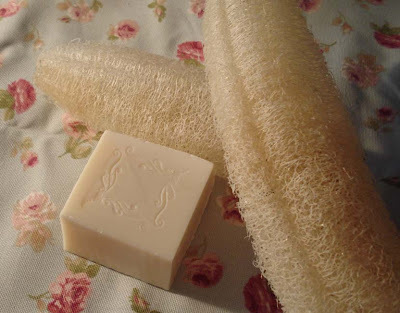 Soap combines lye (caustic soda) with fats - I use only vegetable fats but it is also made with animal or bird fat. The chemical process that takes place, saponification, pulls the ingredients together and over the course of the next three or four weeks, the caustic elements in the soap neutralise, leaving a mild and soothing soap. Skin is the body's largest organ so it makes sense that whatever we rub onto our skin, especially if that is done many times during the course of the day, is safe and nourishing. Home made soap nourishes skin because it contains the natural glycerin, unlike commercial soap. Glycerin is extracted from commercial soap and sold as a separate product - it's more expensive than the soap, but removing it leaves the soap depleted. To counteract this, manufacturers add ingredients to make up for its lost and in doing so, make soap that is not so good for your skin. Homemade laundry powder is another product that can easily be made at home. It's the combination of three ingredients - soap flakes, washing soda and borax, although if you use your grey water on your garden, you should leave out the borax. If you check the ingredients list on your commercial laundry detergent, you'll find a list of chemicals commonly used in many commercial cleaners that you have no idea about. I have been using homemade laundry powder in my front loader washer for many years now and have never had a problem. It cleans our clothes well and they come out smelling clean, not of artificially produced perfumes. Be warned, if you make up the recipe for laundry liquid, it can separate. If that happens, it's fine to use, you'll just need to mix it up to incorporate the liquid with the gel before you use it. If you've never stepped into the world of homemade soap and laundry powder before now, why not give it a try. The powder in particular is easy and quick to make, MUCH cheaper than your commercial powder and does a good job without harming you or your clothes. My post about it and the recipe for it, and many other green cleaners, is here. To make your own soap you'll need to step up a notch. It's more difficult, because you're handling a caustic product that burns, but if you make it when you're alone with no children or pets to distract you, it's easily done. My recipe for cold pressed soap is here. I want to encourage you to start making some of your own products. Not only will it save you money, it will allow you the peace of mind of knowing what you're putting on your skin and on your clothes. There is a feeling of satisfaction that comes with this that you don't get when buying another box of soap or laundry powder. If you want it to, it will help you move further away from commerce and closer to an independent home. I know many people who read here are already doing this, but many are not. So if you're using your own non-commercial soap or laundry powder, please share your experiences with us. 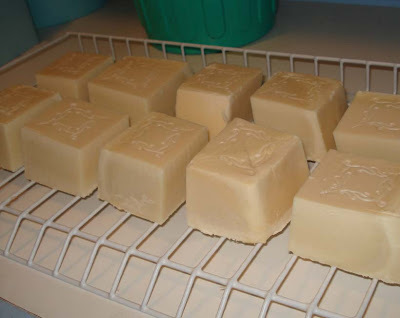 This is a very good soap page with recipes and troubleshooting. PS: I'm really pleased to see so many people interested in the swap. The deadline for joining is Thursday, so there is still time to sign up. 4. whether you want to swap within your country, or internationally. Remember that if you swap internationally it many cost you a wee bit more in postage, but it is also so much fun! Rose will be helping me with the organization and the tracking of the swappers, and I have had many ladies who have signed up as my angels-those who will help me make sure that everyone gets a parcel. A great big thank-you and hug to everyone who is helping! I also wanted to link you to a set of videos on You Tube. They are of Clara, a woman who lived through the Great Depression. She is seen in these videos talking about cooking and giving recipes that her family lived on during those hard years. I found these to be incredibly interesting. Clara is in her 90's now and all I can say is wow! I hope you all enjoy these as much as I did. I don't have time to post today but Eilleen at Consumption Rebellion has written a very interesting and intelligent post at the co-op about Children and the pressure to buy. It's well worth a read. Sharon will be posting later about the new swap. I hope you all jump in and have some fun with it. Changing old habits and establishing new routines is one of the hardest things you'll do when you move from a consumerist mindset to a more frugal and homemade one. When I first changed from my old life, I knew I had to do a lot more for myself but for the life of me I couldn't find the motivation to get all those new chores done. After a period of trial and error, I stumbled onto a good routine that established a rhythm to my days and I have not looked back. I like doing my housekeeping now - it grounds me and remind me every day that all the work both Hanno and I do, helps create a home we love spending time in and a relationship that grows stronger each year. Those home tasks carried out each day remind me that a simple life is a journey, not a destination. Establishing a housekeeping routine can be a daunting task but is made easier by small actions repeated regularly. I didn't know it then, but when I made myself do my daily chores a little bit at a time, before too long, I got into a rhythm that carried me through what I had to do. When I took up the broom and pegs as my tools of trade, I started with a little list of jobs I would do within a certain amount of time. For instance, I would get up, shower, write, feed the animals and chooks, make breakfast, make the bed, clean the kitchen and make bread all before my unofficial time limit of 9 am. By 12 o'clock I had to have swept the floor, cleaned the kitchen benches and stove, and any laundry that needed doing that day. Keeping a list of tasks within a flexible time frame helped and I was surprised that, in the space of about a month, I had established a routine for myself that felt comfortable and easy to work with; and it got my housekeeping done. That surprised me because I hadn't liked doing housework before then, I thought it was boring. 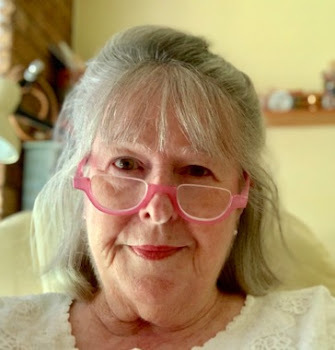 When I had that rhythm, I started thinking about what I was doing, how my work connected me to my female ancestors and how it made my life better. When I made that connection, I started liking most of what I did, I began looking for new things to learn and I settled into my home. At last, I felt truly comfortable in my own home. Now that I look back on it, I know that getting into the rhythm of doing a certain number of chores each day, and repeating those actions, changed my habits and established positive new ones. So I'd like to share with you five things to do every day to help a establish a routine. As you can see, they're five very common things that most of us would need to do each day. I hope you you will add another five things that are required in your own life. This second set of five things will be those things specific to you and your circumstances - whether you have children or not, work outside the home or not, and possibly would change according to where you live. 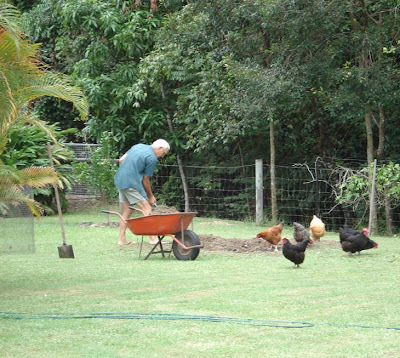 For example, if you live in an apartment, your chores would be different to those you would need to do in a house with a garden and chooks. Make the bed/s. When the children are old enough, this should be one of the chores they learn so they contribute to the running of the home. Wash up or run the dishwasher. Organise and tidy one area a day. This might be the laundry, kids' rooms, the family room or your finances and mail. Know what you'll eat tomorrow. And when you have your daily routine working for you, add one weekly activity: learn or teach one new skill every week. A new recipe, new pattern, new stitch, or work though something over the weeks - like building a compost heap, learning about vegetable gardening, experimenting with sourdough or other fermented foods, teaching your children simple, practical skills like how to sew on a button, tie their shoe laces, tell time or read the sky - during the day for changes in the weather and at night for interest. Learning new skills is something we all need to do and you need to make time for it and put in the effort to do it. At almost 61 years of age, I still look for new discoveries, and I hope I never lose the interest in doing that. I believe that when we lose the will to learn, we stop flourishing. I hope this way of establishing housekeeping routines works for you. It is said that new habits need about three weeks to set up and become part of you. I never timed my changes so I wonder if that is true. Hopefully in a few weeks time, some of you tell me that it is.